RUN PDS SHOP IN RAJSAMAND, GET FISHING LEASE It sells kerosene, sugar, rice, wheat, and occasionally, corn, much like any other public distribution system outlet in the country. 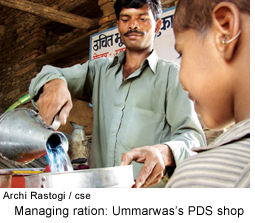 But the ration shop at Ummarwas in Rajasthan's Rajsamand district is refreshingly different from the archetypal public distribution system outlet. The difference lies in the way it's administered the shop is run by a 17-member labourers' cooperative. The cooperative has even secured a fishing lease. The venture had its beginnings in crisis. Mining had been the major avenue for employment people in Ummarwas--and many other adjoining villages--till about five years back. It was then that operations became mechanised, reducing the need for labour. Additionally, labour from Nepal, Uttar Pradesh, Bihar and other parts of the state started to take over work. Unemployment was on the rise when a union of mine labourers, Udaipur Sambhag Khan Majdoor Union, was formed. The union's Rajsamand chapter today has 3,000 members. Sampat Lal Bhil, its secretary, talks with justifiable pride at the way the union pressed for better working conditions. "We are paid in time, have attendance cards, security gear and insurance. Some workers even get provident fund," he says. But more innovative were the activities of the 17-member cooperative that they went on to form Adivasi Karigar Majdoor Shramik Hitkari Sahkari Samiti Limited, Rajsamand. Rana Sengupta, managing trustee of the Jodhpur-based Mining Labour Protection Campaign, the ngo that helped the labourers in their endeavour, says "Unions may or may not be very effective. Cooperatives, in contrast, are surer ways of getting livelihood. 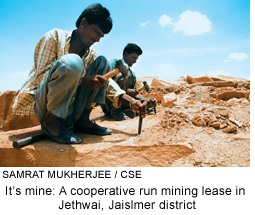 And since a mining lease in Rajsamand was expensive to get, the cooperative looked for alternatives." Alternatives And alternatives they found within the village. In July 2006, the members spotted advertisements in the papers for a lease to fish in the lake at Ummarwas. Though they had no knowledge of fishing, they managed to put up a bid. And the cooperative won it. But breeding fish is no easy activity. The villagers approached a fishing contractor and he guided them to a group of fishermen in a neighbouring village, who worked as a consultant of sorts. They helped with selecting the species to fish and in cleaning up the lake. The roe was procured from far-away Jaipur; this cost them Rs 40,000. There is now a guard at the lake till the fish is harvested. The cooperative plans to harvest the fish after Diwali this year. What about the economics? Sampat Lal, the treasurer of the cooperative, has that worked out well. "We have spent about Rs 70,000 on the fish so far, but the returns should be about Rs 1 lakh, a year. Fish will sell for Rs 40 a kg at wholesale price. The fishermen will buy it themselves, we don't even have to bother with all that," Lal says, counting the nearby markets for fish. Confidence In mid-2006, the cooperative answered an advertisement for a ration shop in the papers. Sampat Lal was sent for the mandatory meeting with the government officials because he is among very few educated in the group. "They preferred us over the others because we are a cooperative of poor tribal," he says with justified elation. The returns from the shop are not that high, but Lal points out, "the aim of the shop is more welfare than profits. This way, the cooperative pays back the union in some ways." The villagers are also show gratitude. Nrip Singh Rana, a resident, says "The pds shop is quite timely. At least we don't have to go elsewhere for provisions." The cooperative is now looking forward to a unicef project on rural development for which they have applied. They also have plans to take up a mining lease, for which they will start saving from the profits of fishing. The mood is upbeat even as Lal gets pensive "The cooperative has seen much worse days. This won't last for long now. The returns and good days will soon start." How to get a mining lease is something Kushala Ram is well-versed with. 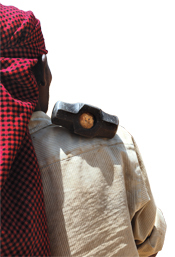 He was a mining worker himself--like a lot of many other people in Jethwai village in Jaisalmer district. That was till 2001, when he cast in his lot with a newly-formed mine workers' union. The union has now become a successful cooperative and Ram's esteem gets an enormous boost when he's involved in any decision pertaining to mining. Not that he minds the money that comes with the endeavour. "It was in the year 2000 that we decided not to take exploitation by mining contractors any more. But we were also aware of our limitations. We knew that we had very few skills apart from those required to work sandstone mines," Ram says. Many like him got in touch with the Mining Labour Protection Campaign in 2000. Interactions with a Jodhpur-based ngo led to the forming of the Pathar Khan Mazdoor Union in 2001. In 2002, 17 of the 95 members of the union came together to form the cooperative, Pathar Khan Sramik Sahakari Theka Samiti. The move was to prove beneficial not just to the members of the cooperative, but also to the labourers who worked at the 170-odd mine leases that operate in the area. "We did form a cooperative, but money was a huge problem, initially," says Kana Ram, the cooperative's secretary. A lease to mine sandstone meant an expenditure of Rs 1 lakh, quite a forbidding amount for a fledgling labourers' cooperative. So till 2003, Pathar Khan Sramik Sahakari Theka Samiti could not follow up its lease applications. They were helped out of the rut by a loan of Rs 1 lakh from Mining Labour Protection Campaign. The first two leases came in 2003. The next big procurement was a crane in 2005. It cost Rs 9.5 lakh. The cooperative borrowed Rs 2.5 lakh from a local bank. The Mine Labour Protection Campaign lent it Rs 4 lakhs. The crane was a necessity, renting it meant Rs 40,000 per month. Today with a few leases, they can adjust the use of the crane and even loan it to others. Next on the cooperative's shopping list is a truck, and later, even a cutter. This would use the scrap, which is otherwise wasted, to make tiles. But all this after the new leases they applied for in December 2006 come through. That people in Jethwai were running their own operation benefited others who worked elsewhere. The most skilled labour would previously get Rs 100 a day. But when the cooperative paid their labour up to Rs 200 a day, other contractors were forced to match up. Other conditions improved medical kits were brought, timely wages were ensured and attendance cards were made. And the best part water was provided at the site. "One would earlier have to get water from about 2 km away. Contractors now provide for water at the site," says Magga Ram, another worker. The working hours are also being followed. The cooperative also got the panchayat to allot land for plantation.We are trying to convince contractors that less money is needed for the compensatory plantation than is needed to bribe the government official, the cooperative members add in unison. The best part, according to them, is the new-found confidence. They now get to collectively decide who to sell their product to, and at what cost. "We allot responsibilities to members for selling. He finds buyers and we all approve. But at least we feel confident that we are managing our own affairs. We are working for our own," gushes Kushala Ram.